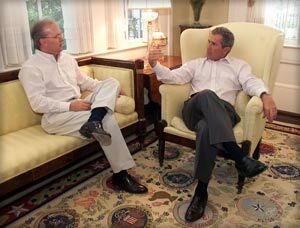 Karl Rove with George W. Bush at the Texas Governor's Mansion in Austin, Aug. 10, 1999. After surviving one of the roughest presidential elections in modern times, President George W. Bush singled out one member of his team in particular, calling Karl Rove the campaign's "architect." But Rove, a longtime Bush adviser and confidant, is much more than a political guru, he is also the single most powerful -- and ambitious -- policy adviser in the White House. In "Karl Rove -- The Architect," FRONTLINE® and The Washington Post join forces to trace the political history and modus operandi of the controversial figure who has been on the inside of every major political and policy decision of the Bush administration. With the campaign over, Rove has turned his attention to the battle for Bush's legacy on issues like Social Security, taxes and tort reform. But his ultimate goal is something larger. "I think what they are trying to do is bigger than the Great Society, and approaches the New Deal. They aren't kidding around." Washington Post reporter Thomas Edsall says. "Karl Rove -- The Architect" traces Rove's biography and political career from his days campaigning for Richard Nixon as the chair of the College Republicans to his recent appointment as deputy chief of staff in charge of coordinating domestic policy, economic policy, national security, and homeland security. Drawing on interviews with most of the major figures in the Bush 2004 campaign, Rove's associates from Texas, Washington power brokers, a Rove biographer, and reporters for The Washington Post, the film examines Rove's plan for the re-election campaign: a "base strategy" that would mobilize Bush's core supporters to turn out in record numbers. "A close look at Rove's method over the years reveals a dual strategy," says FRONTLINE producer Michael Kirk, "one part in-your-face, eye-gouging politics, and another part translating complex policy into simple-to-understand concepts. Both approaches have nourished a new conservative impulse among voters, an impulse that is being used to change the nature of the American government." The program begins on Election Day 2004. As the president emerged from the Crawford, Texas, fire station after voting, the press corps was surprised by what they saw. "The people around him were very concerned that they had lost," Washington Post reporter Mike Allen tells FRONTLINE, "and you see the aides, including the president's daughters … looking like they were at a funeral." And as the day went on, early exit polls delivered to Karl Rove on Air Force One seemed to show a substantial victory for Sen. John Kerry. "The air went out of the airplane," said Bush chief media strategist Mark McKinnon. "The air just got sucked out." But Rove, who had spent years courting what he called the Republican conservative base, immediately crunched the numbers to see if all the handholding and political deal making with that group would yield the turnout he expected. Before long Rove knew the exit polls were wrong. In the end Bush's re-election was the result of many factors including the country's deep concern over national security. But no factor was more important than the sophisticated effort to turn out core supporters. It was an effort Karl Rove had been working on for years -- identifying, learning about, and tailoring policies to meet the political desires of a key group of conservative Republicans. "The evangelicals didn't just come on board for him, they were campaigning. They were at the events, they were the poll volunteers, they were making the phone calls. You know, that's how you win elections," says Washington Post reporter Dana Milbank. Over the past 35 years, Karl Rove has honed his skills at hardball politics, using wedge issues, surrogates, and attack ads, but these methods that the program traces in Texas -- where Rove, in the words of Texas Monthly executive editor Sam Gwynne, helped "midwife" the state from solidly Democratic to solidly Republican -- South Carolina, and in the contest with John Kerry are only a part of the story. Rove tactics have been in service of a long-standing belief in the need to reshape the American political landscape. And in George Bush he found the perfect candidate who has his own ambition to leave a large legacy. Says longtime conservative political activist Grover Norquist, "I think Rove understands the nature of the modern conservative movement. Rove and President George W. Bush have staked out very radical, meaning fundamental, conservative positions . . . I think there's less daylight between Bush and Rove -- it's like two halves of a brain or something. They're both operating in sync and have for years."